A significant change in the weather is on tap for Winnipeg this weekend as temperatures return to near-seasonal values alongside plenty of cloud and light snow. It’s a milder, cloudy weekend ahead for Winnipeg. A series of disturbances will push eastwards over the coming days, bringing unsettled conditions to southern Manitoba. Starting with today, Winnipeg will see cloudy skies with about 2 cm of light snow that will taper off later this afternoon. Temperatures will climb to a near-seasonal high of -13°C with 30 km/h southerly winds in the morning tapering off and shifting to the north. The city will likely see periods of light snow overnight as temperatures dip to a low near -20°C. Saturday will see Winnipeg dodging a fairly substantial winter storm. 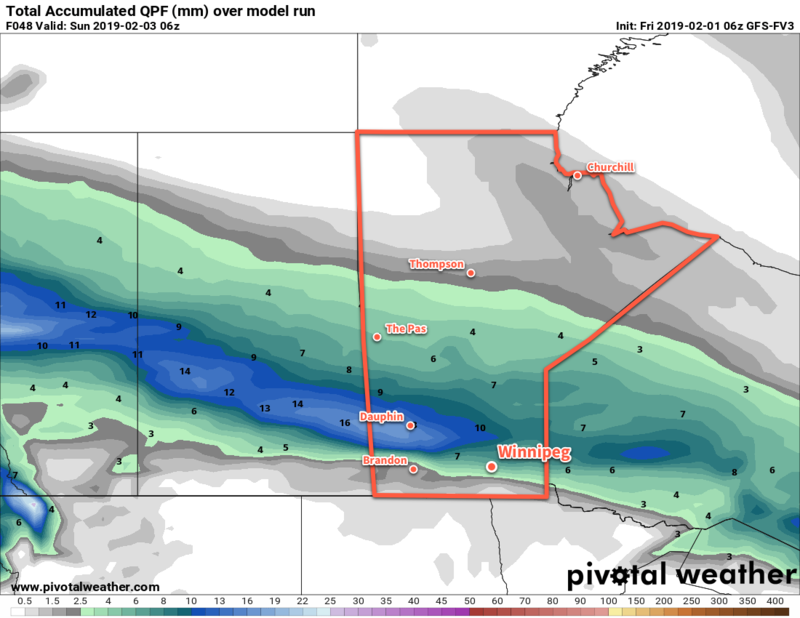 A broad area of moderate to heavy snow will pass north of the city, beginning over western Manitoba and spreading across the Interlake into eastern Manitoba through the day. Snowfall totals over western Manitoba could reach 30 cm with 10 to 15 cm likely for the Interlake and areas east. The city will likely see cloudy skies and periods of light snow, but accumulations of only 2 to 4 cm.1 Temperatures will climb to a high near -15°C and winds will be out of the northeast near 20 km/h. The snow will taper off Saturday evening followed by some breaks in the cloud and a low near -20°C. A large swath of the Prairies will see up to 30 cm of snow over the next 2 days, but Winnipeg is forecast to miss out on most of it. Winnipeg will see mainly cloudy skies on Sunday ahead of the next system developing that will move through the region. Most forecast models show a significant Colorado Low developing Sunday into Sunday night. There’s some uncertainty as to where the main snow for this system will set up; some models push it across southern Saskatchewan into southern Manitoba while others keep it primarily south of the border with southern Manitoba just seeing a glancing blow. Ultimately, the details won’t become clear until a bit closer to the event. If it is going to snow, it’s likely that snow wouldn’t push into the region until a bit later in the day on Sunday. The city will see a high near -14°C with northeasterly winds continuing. Temperatures will head to a low near -24°C with a chance of snow on Sunday night. Next week will start with any remaining snow moving out of the region, followed by a prolonged stretch of below seasonal temperatures. It won’t be as cold as the last cold snap, but it does look like much of the week will see daytime highs near -20°C with overnight lows near -30°C. Winnipeg’s seasonal daytime high is currently -11°C while the seasonal overnight low is -21°C.